Discussion: Fantasy author Michelle M. Welch sends in a comment about authors also needing to get used to the idea of e-books, both from the product and marketing perspective, which leads to a chat about ideas for authors to do their own marketing and promotion, advances. 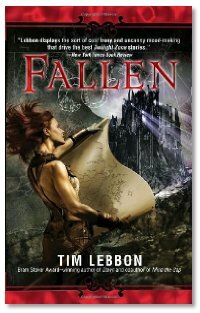 Interview: Michael and Michael talk with Tim Lebbon about Fallen, the latest book in the land of Noreela, taking place about 4000 years before the events of the first two books, Dusk and Dawn. Hear how these grim and gritty fantasy novels came about, and some of the plans he has for future stories in this world. Is anyone else having trouble downloading the new episode through iTunes? I can't d/l any of the files in the C2C feed, even when I resubscribe. Downloading directly from the website has been an issue for weeks now too. Takes hours to finally initiate a download lately. I use Juice at home and by the time I get home from work it seems to pick up the latest episode ok - but that is usually 8 or so hours after the episode appears on the website here. What appears to be happening is that for the first few hours after an episode has been posted it is very difficult to get regardless of the method you use. BTW, that Parsec Awards promo is frakkin' hilarious. Heard it a few times now and it seriously doesn't get old. That promo, and the "Leave (insert idol here) alone!" never, ever get old. As for the slow and delayed downloads, seriously, that problem should be old news in the next few days or so. Tim Lebbon had me sold on his books the moment he mention "sentient tumbleweed"
A couple of things about ebooks. I have a Palm Centris (smart-phone) and I have both the Palm ebook reader and Adobe Acrobat Player for the Centris. I've read several ebooks on my Centris. One big problem with ebooks right now is the price. Several publishers were charging $28 (full store price) for recent ebooks. That's outrageous. I will pay extra for an audio recording of a book because that is a lot of extra work, but why charge me full price when you aren't giving me a physical book? The publishers are saving a lot of money by selling an e-book, so don't gouge the readers. No paper, no ink, no printing, no shipping no warehousing...if they're not saving money they're doing something wrong. Great interview with Tim. Dusk and Dawn are sensational books, and anyone interested in fantasy without having a closed mind about what fantasy should be about must read these books. At the very least read his incredibly spooky short story, White, if you want something that stretches the boundaries of horror fiction. I've noticed that Dragonpage has a lot of fantasy books listed in the library, but less science fictions, which is odd. Is science fiction dying? I really enjoy, by the way, Laurie's contributions — someone who actually reads the books. Authors must love her. And if they don't. they sholudl!